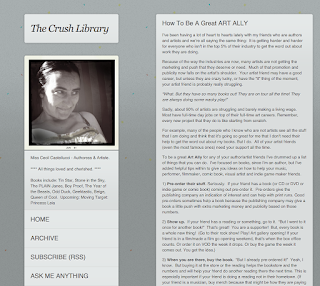 This post at Cecil's blog, How To Be A Great Art ALLY, is really worth reading. And, for us creative types, worth sharing widely with the people in our lives. From "Pre-Order Their Stuff" to "Make Sure It's In Your Local Library Branch" to "Be A Good Literary Citizen," Cecil shares a list of ways "To be a great Art Ally for any of your author/artist friends." Pre-order their stuff. Seriously. If your friend has a book (or CD or DVD or indie game or comic book) coming out pre-order it. Pre-orders give the publishing company an indication of interest and can help with print runs. Good pre-orders sometimes help a book because the publishing company may give a book a little push with extra marketing money and publicity based on those numbers. 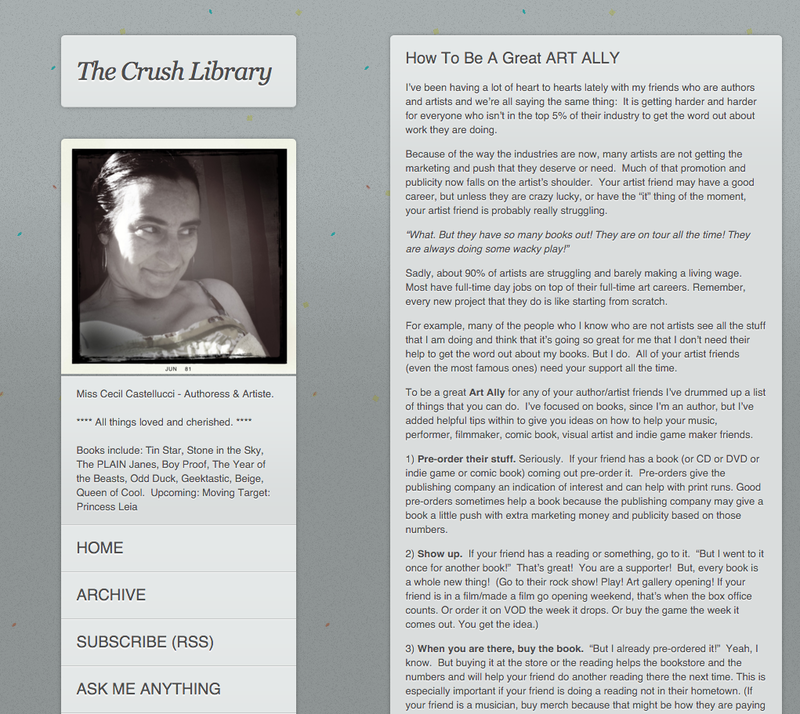 And let's all be great Art Allies to each other, and spread the word on exactly how to do it! Have you been following the "A Birthday Cake For George Washington" Controversy? In the aftermath of the controversy regarding how slavery was depicted in the picture book "A Fine Dessert" in the last months of 2015, this story has been unfolding in the past few weeks. You can read up about it at Betsy Bird's Fuse #8 blog on School Library Journal here, or in the Ron Charles Washington Post article here, or listen to the story on npr here. The short version? The picture book had a "sanitized" portrayal of slavery, which at first had very little reaction, then a backlash with Scholastic defending the title on January 15, and then two days later announcing they were pulling the title from shelves. The School Library Journal called the book "highly problematic" and Kirkus Reviews labeled it "an incomplete, even dishonest treatment of slavery." But neither of these critical reviews generated a public response from Scholastic. 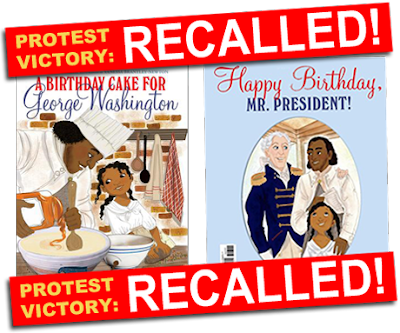 That January 18th article ran with this image of the book's front and back covers under the banners "Protest Victory: Recalled!" While it is perfectly valid for critics to dispute a book’s historical accuracy and literary merit, the appropriate response is not to withdraw the volume and deprive readers of a chance to evaluate the book and the controversy for themselves. 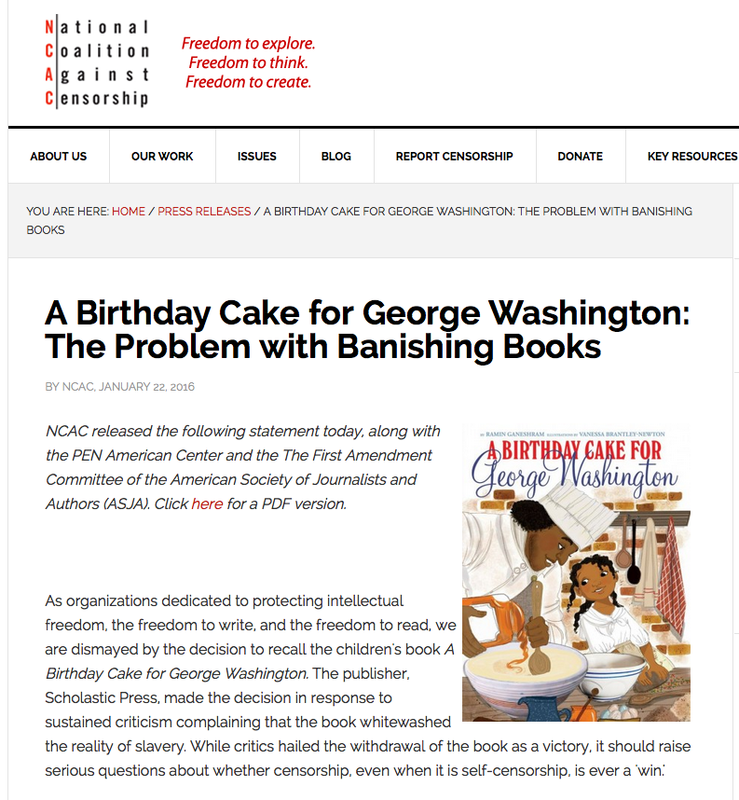 In the case of A Birthday Cake for George Washington, a book is gone that generated important discussions about how our nation creates, perceives, and perpetuates narratives about slavery and slave ownership. 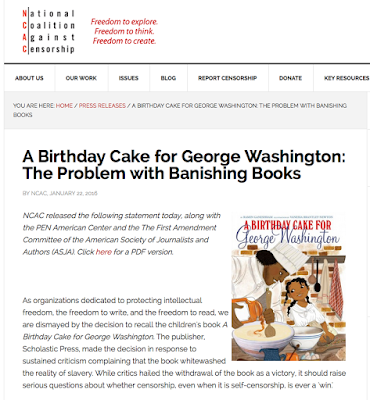 Those who sought the removal of A Birthday Cake for George Washington and those who acceded to that request should recognize that other books they might consider valuable could be vulnerable to the same fate–censorship in the face of controversy. This outcome is likely to have a chilling effect, leading authors and illustrators to hesitate in taking on racially sensitive or politically controversial topics for fear of public outcry and reprisals. Pulling books out of circulation simply because they cause controversy is the wrong decision. It's worth considering what are the lessons we can all learn going forward--for authors, illustrators, even for publishers? Because that "chilling effect" of future books avoiding potentially controversial topics (which would certainly include many representations of diversity) is a chilling outcome to consider. What are some of the lessons you see from this? Critically acclaimed children's book author Jane Yolen created this grant to honor the contribution of mid-list authors. The grand awards $3,000 to mid-list authors and aims to help raise awareness about their current works-in-progress. 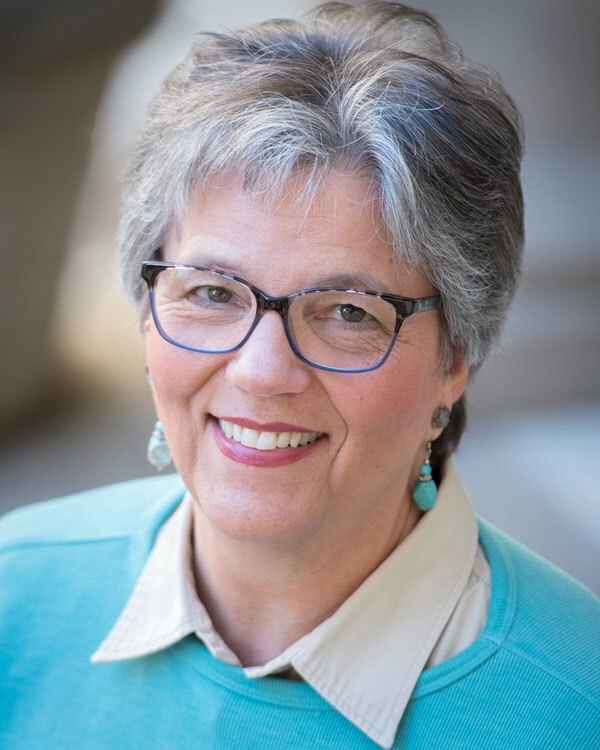 There are two winner this year, and here's an interview with winner Sallie Wolf! Lee: You’ve written and illustrated - when you’re working on a project, does it evolve visually first, or does it come to you in words? Sallie: When I first decided I would write children’s books, I hoped to illustrate as well. But the writing came more easily than the art, although I could always see my story in my head. After the publication of Peter’s Trucks, in 1992, illustrated by Cat Bowman Smith, I went to the School of the Art Institute of Chicago and eventually earned a BFA in drawing and painting. I consider myself an artist and writer, but not a traditional illustrator. My second book, Truck Stuck, I dabbled in making a dummy, but it seemed like more work than fun. That book is illustrated by Andy Robert Davies in wonderful, child-friendly, scribbly drawings with great humor. For The Robin Makes A Laughing Sound: A Birder’s Journal, the art inspired the writing. I was looking at 12 collages of birds I had made on an old calendar, and I realized that I had almost half of a children’s book—all I needed was text to go with the bird imagery. Simple, right? I began to write down in prose everything I knew through observation about each of the birds on my calendar. 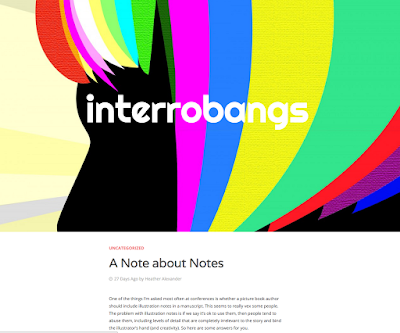 One thing led to another—the prose became poems. I switched from collages to the sketches that were the sources for my collages. I decided to focus by season rather than by month, and that opened up possibilities for different kinds of poems and other birds. But the art inspired me to write about the birds, and in the process create more art until the book was complete. The pages were designed by a barista at my local Starbucks, where I went to write every day. Micah Bornstein is also an artist, writer, and bookmaker who knows Photoshop and could work with scans from my journals. His wife is a children’s librarian so he was familiar with quality children’s books. The whole creation of this book was very unconventional, and I was amazed that Charlesbridge would let the two of us, both inexperienced in illustration, work so freely. And I am extremely pleased with the end result. We designed the book to resemble a journal, including “cursive” rough drafts, journal excerpts, and bird lists as well as printed poems and sketches. Lee: Can you share about a project that you hope will be your next published book? Sallie: I have two projects under way for which I would also like to create the art. The first is a collection of poems, (working title—Old Moon, New Moon), about my 20+ years of observing the moon and making art from those observations. The poems begin by wondering why the moon is out in the daytime and lead the reader from that question, through the muddle of not knowing, to understanding. This is a book that encourages the reader to focus on an interest of his or her own, observe over time, and record in words and images what he or she is learning. I intend to use imagery derived from my Moon Project art installations to illustrate the poems. You can learn more about the Moon Project, and even listen to “Moon Song,” a Gregorian Chant created by translating observed movements of the moon into musical notes, on my website, www.salliewolf.com. Old Moon, New Moon is not exactly about the moon, but more about my relationship with the moon. As in the Robin book, I intend to provide a window into my creative process through the writing and the illustration. And here again, the art came first and is inspiring the writing and the creation of a book. My other project, Summer Upside Down: A Day on Bear Camp Pond, is the story of a day spent by a parent and child canoeing on a secluded New England lake. It is told in prose and haiku, much the way Basho, the Japanese haiku master, wrote journals of his travels in prose and haiku. I have been working on watercolor sketches for this story as I develop the manuscript. Observation of nature is important to this story, but it is also about the loving relationship of parent and child played out against the backdrop of a sudden storm. Lee: How long have your been a member of SCBWI, and what do you feel you’ve gained by being part of this community? Sallie: I joined SCBWI in 1992 when the wonderful Illinois region was fairly new and under the nurturing care of Esther Hershenhorn. Esther set a wonderful example of being welcoming and generous, and I soon became involved various programs. I have attended most of the Illinois region writing retreats, which evolved into Prairie Writers and Illustrators Day, and I have been a network co-rep for years. I also help organize “Food For Thought” programming for published members. Being a member of SCBWI has given me so much—the programming in Illinois is outstanding, and I’ve had numerous opportunities to meet with editors for critiques as well as hear wonderful keynote speeches. I have attended the LA conference once and will go to the NYC conference for the second time this February. I’ve applied for several grants in the past, and even though I did not win one—until now—the process of submission was very helpful in pushing my manuscripts forward and making me formalize my career goals. Most important is the friendship and community of fellow writers. When people ask me how to publish a children’s book I tell them to join SCBWI. Anyone who is serious about getting published belongs in this organization. You can find out more about Sallie at her website here. "What matters most, more than training or luck, is the heart." "Heart is what drives us and determines our fate. That is what I need for the characters in my books. A passionate heart..."
"Nice people with common sense do not make interesting characters. They only make good former spouses." Critically acclaimed children’s book author Jane Yolen created this grant to honor the contribution of mid-list authors. The grant awards $3,000 to mid-list authors and aims to help raise awareness about their current works-in-progress. 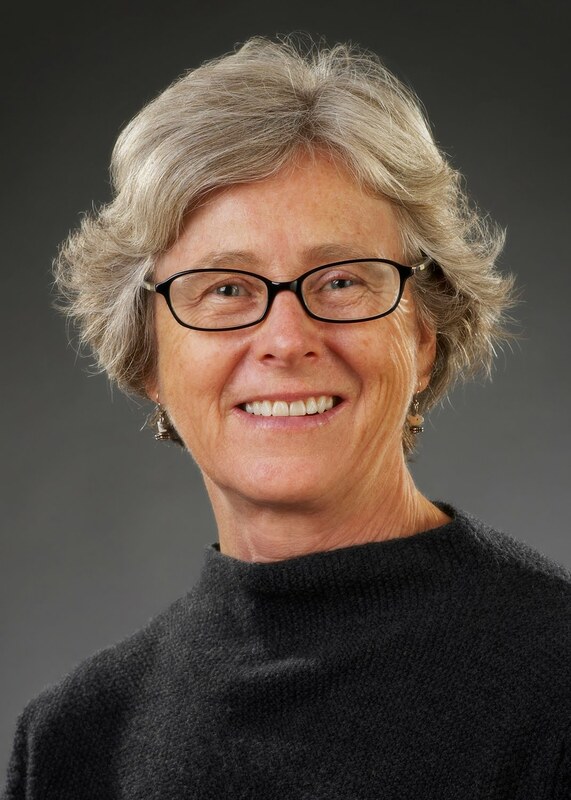 There are two winners this year, and here's a spotlight on winner Karen Coombs! In the 1970s, I spent my first SCBW conference (no “I” back then), zombie-ing around with my mouth agape. Sid Fleischman. Jane Yolen. James Cross Giblin. Frank Sloan. Sue Alexander. Eve Bunting. Plus, the featured presenters. In person! In the same room! I silently blessed Lin Oliver and Stephen Mooser for founding the organization and tried to close my mouth so as not to appear a total greenhorn, or to say something obsequious and appear a sycophant. I had, after all, been published in magazines. And I knew other well-known children’s writers, such as Barbara Williams, Gloria Skurzynski, and Ivy Ruckman, who had mentored me and introduced me to the organization. I returned home inspired, motivated—and filled with the realization that I was meant to write for children. At another conference in 1986, now living near San Diego and missing my old critique group, I hopefully posted a notice on the conference bulletin board: Published writer seeks critique group in North San Diego County. Into my life walked Edith Hope Fine and Judith Josephson. We held our first meeting soon after and have met twice a month ever since—thirty years this coming summer. 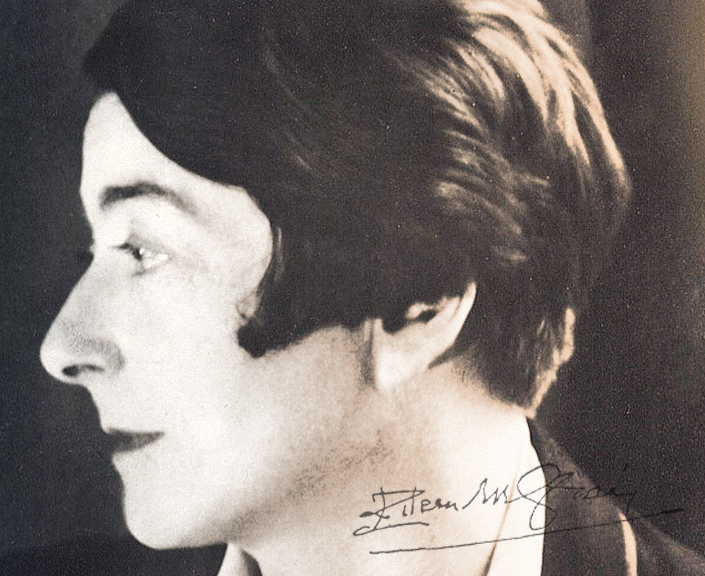 While SCBWI gave me my people, Emerson gave me my favorite quotation: “May the work that you do be the play that you love.” What I love best about writing is that it allows me to follow my interests no matter where they lead. I’ve published both fiction and nonfiction for young children to young adults, which means no one can say, “Oh, she writes MG magical realism/PB biography/YA dystopian,” etc. I don’t fit into a slot. When an idea calls to me, I write that book, no matter the genre. Ships that brought women to Virginia to marry settlers in the 1600s. Animals used for research. Confronting a bully when I was six. Talented people I admire. The loss of a child’s toy. All these inspired books in different genres. Ideas are like my “to be read” stack of books—they continue to pile up, waiting patiently for me to get around to them, until the one that calls the loudest gets my attention. Currently, I have underway or ready to submit a middle grade historical novel set in the West in the late 1800s and a number of picture book manuscripts. One humorous picture book deals with a character’s reluctance to face new experiences, even though it means spending all his time alone. When an unfortunate event forces him to leap headlong into the shunned activities, the experience is a revelation. Moving can be wrenching for a young child, especially moving away from beloved grandparents. In another picture book manuscript, a young boy—with subtle help from loving grandparents and his single dad—discovers a satisfying way to stay in touch. Can a reluctant cricket save the bees’ honey hive and turn an enemy into a friend? In a world where peace seems precarious and differences divide, young readers of this manuscript will be reassured to learn about natural adversaries who find an amicable solution, and who, with a nod to American folk hero Davy Crockett, discover that even one small creature can make a difference. You can find out more about Karen at her website here. I especially like the idea of re-imagining them as "stage directions." Take note. (pun intended.) And read the piece. It's well-worth it. David J. Peterson won a competition to design the Dothraki language for Games of Thrones. And then he created two more languages for the show. He also invented Shiväisith for the Marvel blockbuster Thor: The Dark World, and four languages for the SyFy show Defiance. 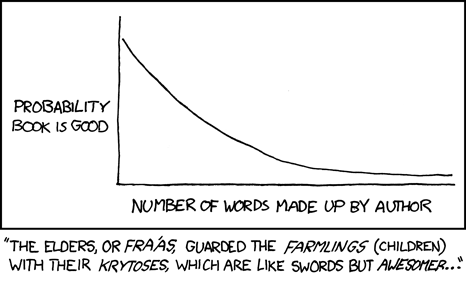 I separate the process into three distinct branches: sounds, word meanings, and grammar. I usually start with the sound system, which affects grammar, and also with nouns. There's a very kind of technical part to it, which is creating the grammar, making sure that it works and making sure you've got all your bases covered. It's very much like programming, puzzle-making or problem-solving. But then there's a very artistic component, which is the creation of the lexicon: deciding exactly how this language you're creating is going to encode the vastness of the world. All languages can say everything. The way that they differ is how they say what they say, and that's what makes language so fascinating. Grammatically speaking, every language has syntactic categories – go ahead, find me a language with no verbs, I dare you! All languages have rules governing the formation of words and sentences, negation, question-making, imperatives, and verb tenses. ...When it comes to spoken languages, each and every one on our big blue planet uses a subset of possible speech sounds; in that subset, you’ll find both vowels and consonants. There's even a section on Alien Languages. Go forth and invent, but to paraphrase Tim Gunn on Project Runway, "use your power to invent words thoughtfully." Or, as this author/illustrator put it so well (and somewhat snarkily), in their "Fiction Rule of Thumb"
Now there's fire for our creative lives! You can learn more about modernist designer and architect Eileen Gray here.